Toppik Coloured Hair Thickener is an innovative colour spray solution designed to disguise areas of thin or thinning hair, scalp show-through, bald spots and root re-growth between colour appointments. This lightweight, long-lasting hair thickener is gentle on the scalp, safe for everyday use and available in 5 shades that resist wind, rain, and perspiration. 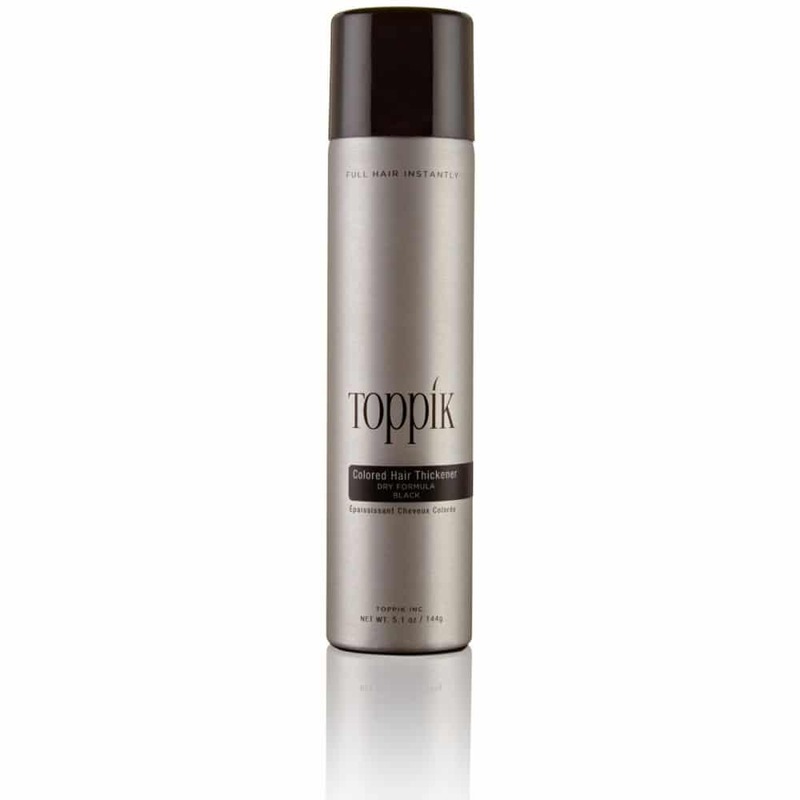 Toppik Coloured Hair Thickener is ideal for those with wider or broader areas of thinning hair or scalp-show through. 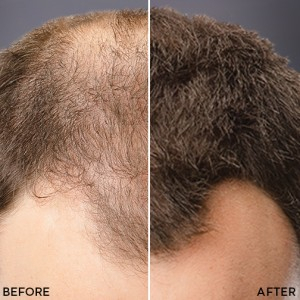 For example, if you have hair loss on the crown of your head, it is most likely a larger area of hair loss, and can also be a harder place to reach. Toppik Coloured Hair Thickener, with its spray application, allows for easy delivery to this specific area while also covering up any thinning hairs. If you have patchy or uneven hair loss, you might also benefit from using this hair cover up product. The colour spray solution makes it easy to apply efficiently and quickly, and the spray nozzle allows you to easily target different areas of hair loss. Lastly, Toppik Coloured Hair Thickener is also the best treatment for baldness because the formula does not require hair to adhere to. If you have scalp-show through, this bald spot concealer sprays directly onto the scalp and helps the areas with hair loss blend naturally with smaller patches of existing hair. What makes Toppik Coloured Hair Thickener unique is the wide variety of uses the product offers. Toppik Coloured Hair Thickener doesn’t just act as a bald spot concealer, it also gives hair a fuller look and feel. When using to conceal scalp show-through, you can see that not only does it cover and hide any areas of hair loss, it also makes hair appear thicker, as if it were your own hair! Toppik Coloured Hair Thickener is the best treatment for baldness because you are adding thickness while also covering areas of thinning hair. This product is also great for touching up roots and covering any signs of root re-growth between hair colour appointments. Worrying about dark roots showing through or grey hairs making an appearance is no longer an issue with Toppik Coloured Hair Thickener! 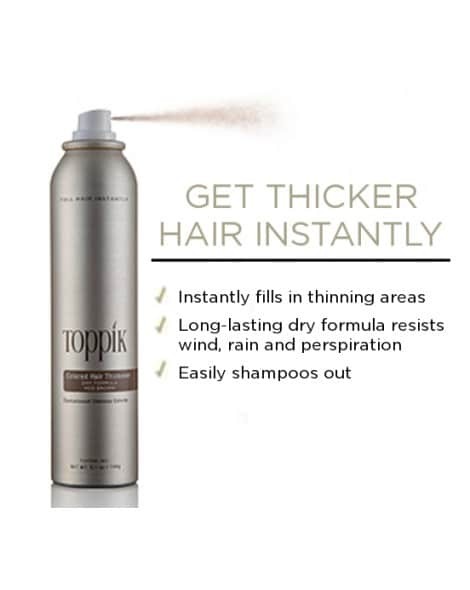 Another great benefit is that Toppik Coloured Hair Thickener works well with our best-selling product, Toppik Hair Building Fibers. First, spray Toppik Coloured Hair Thickener onto wider areas of hair loss or thinning, then supplement with hair fibres where needed for added texture and coverage. Make sure to let Toppik Coloured Hair Thickener dry completely before applying the hair fibers.